Rules on probation can vary greatly from one state to another, and Iowa is no exception. There are several laws regulating probation in the state, and individuals who are under probation in Iowa will need to make sure to discuss specifics with their probation officer as rules do vary based on the specific crime and circumstance. However, the rules for reconsideration of a felon's sentence and the extra probation time for probation violation are unique in Iowa. 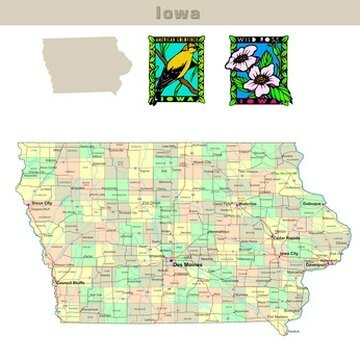 Probation in Iowa is similar to many other states in some ways, as the general definition of probation in this state is a suspended sentence. In this situation, an individual on trail is found guilty, but part or all of the jail sentence can be set aside for probation instead. As such, convicted individuals must stay in the state of Iowa. Sometimes they are assigned residence at a half way house, and there are often other conditions such as weekly calls and meetings with a probation officer and staying out of legal trouble of any kind. Probation in Iowa generally lasts for as long as the amount of the remainder of time on a jail sentence. What Does "Absconder From Parole" Mean? Reconsideration of felon's sentence in the state of Iowa falls under Iowa State Code 902.4, which states that for a period of one full year from the date when a person is convicted of a felony, other than a class A felony--which is an automatic life sentence--after 90 days served in prison the court can order a review of the case and the person returned to the court. This means that the convicted felon can be released for probation up to one year while the review of the case is taking place. In the state of Iowa there are special laws revolving around probation violation. Governor Chet Culver signed House File 2377, which goes into effect as of July 1, 2010. This law states that an individual who is found violating probation does not necessarily have to go to prison to serve out his or her sentence anymore. Judges have the ability under this rule to add on an extra year of supervised probation to the current probation period that is being served. Criminal Law: What Is Probation? Dayton, Monty. "Probation Rules in Iowa." , https://legalbeagle.com/6637509-probation-rules-iowa.html. Accessed 19 April 2019.